We all know that riding a motorbike is fun. It’s thrilling to feel the rush of the wind as you race down the open road. It’s incredible when you lean to turn, and you’re almost touching the tarmac. It’s breathtaking to stop after traveling at a breakneck speed. All that is true. But as a motorcyclist, you have to be aware of the dangers present on the road. You need to understand that you are more vulnerable than anyone else when you’re riding. You don’t have a car to protect you. You have leather pads and a helmet. If a car crashes into you or you lose control, you could suffer serious, life-altering injuries. Here are some of the dangers you need to be aware of. Technically, it’s not illegal for motorbikes to queue jump. It happens all the time, but that doesn’t mean it’s not dangerous. If you’re in congestion it can be frustrating. An advantage motorbikes have is that they may be able to drive right through it. But in this instance, you need to be aware of two dangers. The first is that cars will be switching lanes, often fast without warning. They could block your path causing you to crash. The second is that some cars will deliberately attempt to block you in. With a train of thought that equates to “If I’m not moving, you’re not moving”. If this occurs and they cause an accident you may be able to make a claim. There are another two issues that can make overtaking on a bike dangerous. The first is that a driver might not see you. Due to the size of a bike they often fit completely into the blind spot of a driver. Not all drivers constantly check their blind spot even when they are overtaking. If this happens, they could hit you before they ever realize what happened. Then there’s negligence. If a driver is checking music or worse, on their phone they might not notice a bike. They could break causing an accident or swerve. If they hit you in these types of cases they are legally accountable. You might want to think twice about riding in bad weather. Again, there’s no law preventing riders from taking to the roads in poor weather conditions. But you will find the roads are more dangerous for bike riders. Riders don’t have as much grip in heavy rain and accidents are common. The other issue in poor weather conditions is poor visibility. If a driver can’t see you due to bad weather, the accident may not be their fault. At least part of the reason for the high number of motorcycle accidents is dangerous maneuvers. Riders think that they can treat the laws of the road different because they are on a bike. This is not the case, and you have to be careful with this assumption. 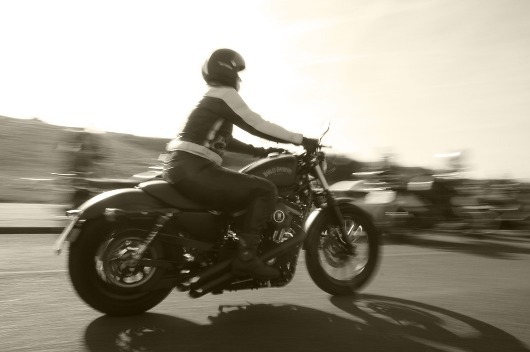 If you are found riding dangerously, you’re the one that might be found legally responsible.